Real Racing 3 launches in North America tomorrow, and fans won't need to drop a single red cent on the third installment of Firemonkeys' console-quality racer if they don't want to. 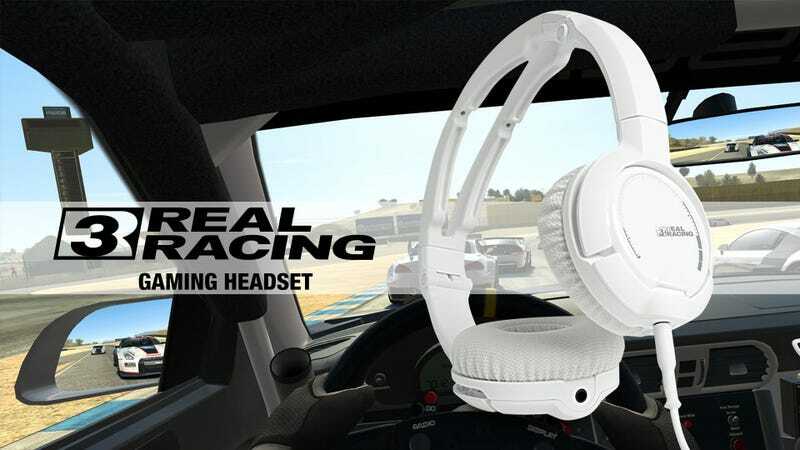 That'll free them up to spend $100 on the special Real Racing 3 edition of SteelSeries Flux headset. I can't recall another mobile game release that was accompanied by pricey peripherals, so excuse me while I roll around in the novelty of it all. EA's high hopes for the first free-to-play, microtransaction-heavy entry in the Real Racing franchise are reflected in this headset's shiny custom ear plates. The Flux is a lovely headset—I said as much when I handled it during the Guild Wars 2 launch. It's also highly customizable, so all SteelSeries and EA had to do here is slap on a fresh pair of decals and call it a day. The engines of your rides in the Android or iOS version of the game will sound lovely, and you'll have proven your loyalty to the Real Racing brand. Surely someone out there has that much loyalty. The Real Racing 3 Flux Headset is available now for $99.99.